Another major land owner in the area after the Civil War, Littleberry Ambrose Ellis bought 2,000 acres of land in the Mills Battle and Cartwright Leagues in 1868, just one mile west of the Sugar Land mill. This included a station on the Southern Pacific tracks, known as Walker Station. Ellis named the plantation Sartartia after his oldest daughter. He later added 3,300 acres north of the railroad, most in the Battle League, but some in the Alexander Hodge League. In 1879, Ellis and Cunningham became partners contracting with the State to use prison convicts for labor. In 1883, the partners built a brand new 600 ton raw sugar mill on Ellis’ land about a mile west of the Cunningham mill at Sugar Land. They named the mill “Imperial.” Just a year later, the partnership dissolved with Ellis retaining his original 5,300 acres and the Imperial Mill. He moved to Austin and turned the operation of the plantation over to his two sons, W. O. (Will) Ellis and C. G. Ellis. Raw sugar had a limited market because of its short shelf life. By the late 1800’s, it was being refined into a white, granulated product that could be shipped to distant markets. 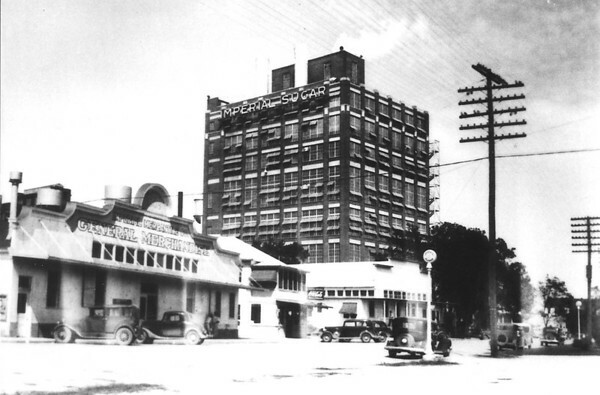 It was Cunningham’s business savvy that led to the first sugar refinery in Texas. The Cunningham Refinery opened in 1896, state-of-the-art and built at a cost of $1.5 million. Known as the “Texas Sugar King,” a fledgling town emerged under his ownership that included a store, post office, paper mill, acid plant, meat market, boarding house and depot. But Cunningham’s success was cut short by a series of misfortune in bad loans, two major floods and the Great Storm of 1900 that devastated Galveston and the upper Texas Gulf Coast. Massive debt forced his company into receivership and the next important chapter of Sugar Land’s history as a company town.